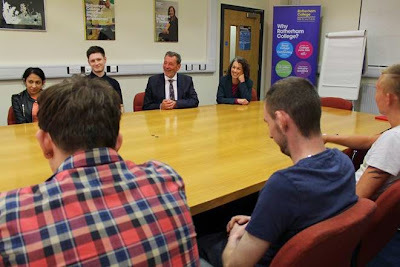 Sarah Champion, Labour Parliamentary Candidate for Rotherham, and former Home Secretary David Blunkett visited Rotherham College recently to discuss apprenticeship schemes and to promote the college's drive to recruit 100 apprentices in just 100 days. The "100 in 100" campaign is backed by Rotherham Metropolitan Borough Council, Rotherham Investment & Development Office and the Barnsley and Rotherham Chamber of Commerce. The campaign is a joint venture with Dearne Valley College and the colleges are challenging local companies to get involved and pledge to support an apprentice. Since the campaign went live on Tuesday March 3, 58 apprentices have found employment in a range of roles including engineering, construction and business administration. The campaign is well on target to achieve its aim and find 100 apprentices employment. James Burrows, plumbing apprentice at PC Kelly Plumbing and Heating, was the first apprentice to find employment. He said: "I opted for an apprenticeship because I'm more hands-on and because it's a great way to gain knowledge. You learn the theory side of the trade at college, whilst getting the practical experience in the workplace." PC Kelly is based at Parkgate, Rotherham and they undertake all domestic and commercial plumbing work. The company employs 15 staff members and James is the second apprentice they have employed to tap into the skills and knowledge of their original workforce. Ryan Kelly, company director at PC Kelly (pictured above, left), said: "We've already seen the benefits of employing an apprentice and that's why we've pledged to support the campaign and offer James an apprenticeship. "The advantage for us is that we get to train someone up to our standards, in return we support our apprentices as much as we can and provide them with the skills to become qualified." Sarah Champion, Labour Parliamentary Candidate for Rotherham, added: "For me, apprenticeships are a real option and should be seriously considered by young people when deciding their future. "They offer a great way of investing in a generation and providing them with skills and training so they are work ready. Rotherham now has the 31st highest rate of unemployment in the country. The only way we can achieve long-term economic recovery and stability is by making sure our young people have real prospects for the future."